Egyptian state media has come under fire for what many considered to be distorted coverage of Sunday evening's bloody clashes that took place in Cairo’s Maspero district off Tahrir square between thousands of Coptic demonstrators and Muslim supporters who were peacefully protesting recent church burnings and calling for equal rights for Egypt's 8 milllion Christians, and military and police forces armed with tanks, tear gas and live ammunition. At least 21 protesters, mainly Copts, were killed as army tanks ran over several young people and police shot rubber, and live bullets according to multiple eye witnesses, into the crowd. The army said that three military police soldiers were also killed. Meanwhile, the Egyptian ministry of health confirmed that at least 329 were injured by the end of the evening. A number of critics say that Egyptian state television not only failed to calm matters, but actually played a role in aggravating an already tense situation. In an unprecedented move, broadcasters on state television at one point called on the Egyptian public to head to Maspero en masse to defend Egyptian soldiers from what they described as "angry Christian protesters". Indeed as the night unravelled, vigilante mobs attacked demonstrators fleeing police bullets and tear gas, using machettes, swords and cudgels. Call-ins to state TV from viewers, meanwhile, supported the state’s official version of events and backed up anchor's frantic pleas. "Armed Christians clashed with and killed military police," one call-in viewer claimed. State television also aired footage of injured military police officers, but failed to carry images of flattened corpses of killed demonstrators which were circulating virally over internet sites. Minister of Information Osama Heikal later attributed claims made on state television that Copts were attacking the army to “emotional stress” on the part of the news anchors. "Announcers reported that Christian protesters had attacked the army only because they were under emotional stress,” Heikal stated. He went on to urge Egyptian media – both government and private – to exercise caution when broadcasting news. But this didn’t stop some political activists and journalists from calling for Heikal’s resignation. Prominent Egyptian publisher Hisham Kassem suggested that lawyers lodge an official complaint against Heikal and state television broadcasters. Kassem pointed to newscasts aired Sunday night as evidence that state media was contributing to sectarian strife. Former member of parliament Gamal Zahran, for his part, called for an investigation into “state television’s role in encouraging sectarian division." Zahran, too, called for Heikal’s resignation. Coverage of Sunday’s clashes by state media also came in for criticism by none other than state television employees. On his Twitter account, state television news anchor Mahmoud Youssef insisted that he had not been responsible for official coverage of events. Dina Rasmy, a newscaster on state television’s Channel Two, declared in a statement posted on Facebook on Monday that she was “ashamed” of working for state media, which, she said, "had proven itself to be a slave for whoever rules Egypt." Rasmy went on to say that national television was effectively encouraging “civil war” by calling on Egyptian citizens to go to Maspero to support the army against what it called "Christian aggressors." Notably, live broadcasts by the privately-owned 25 Channel were cut after military police stormed its headquarters, located in the Maspero district and overlooking the site of the bloody battle, three different times between 7pm and 10pm. The army said that they were searching for hiding protesters, while others postulate that they were seeking to confiscate tapes with video footage showing armoured vehicles ploughing into unarmed demonstrators. Until now, the channel's management has not issued an official statement on the incident. The 25 Channel was not the only news network with offices in Maspero to be stormed by military police. The offices of the US-based Al-Hurra news channel were also stormed while covering Sunday’s events. One Al-Hurra reporter said later that the network had been forced to halt its coverage of the clashes "for security reasons." Egyptian Copts have long complained of biased media coverage from state owned TV and printed press on issues relating to their years-old demands for equal citizenship rights in Egypt. The military assault against the Coptic demonstration at Oct 9 shows clearly that the command of the political transition to democracy in Egypt cannot be solely in the hands of the SCAF. Egyptians most important demand now must be: the command of the transition by a more diversified and balanced body, at which military may be represented, but may not have a monopoly or majority. All government press, whether in print or over the air, should be eliminated. Let private press take over and compete for people's attention. I believe that The People can distinguish between fair and unbiased coverage from propaganda organs. The peoples of successful Arab Springs should stage sit-ins and demonstrations until government presses are eliminated. is there really a need for state owned media anymore? this was just the propaganda arm of mubarak. but we have a free and vibrant democracy now ... which needs to be informed by unbiased media. 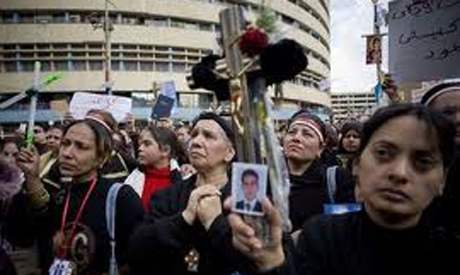 The Maspero Massacre of Copts on October 9, 2011 will go down in history as another black mark of shame on the head of Islam.